Getting to Know Oregon’s Own Marionberry! Disclaimer: This Article Contains no Jokes about Washington D.C. Elected Official Marion Barry. Seriously, not one. Oregon’s marionberry, named for the county of its infancy as a species, may just be the food that best defines the Beaver State. Even though it is a relatively new species compared to the hazelnut (filbert if you’re my granny), the Chinook salmon, and the mighty Dungeness crab, the marionberry has quickly become the food ambassador for the state. And, though it hasn’t happened yet – at least two campaigns have failed so far – the marionberry may one day be enshrined by the state legislature as an official food of Oregon. Named for Marion County, where it was first extensively tested, the Marionberry is a cross of the Chehalem and Olallie blackberries, which are in turn both crosses themselves (more on the family tree, below). But what makes a marionberry a marionberry? You might also ask what distinguishes it from the Himalayan blackberry or other European evergreen species of blackberries that are now classified as noxious weeds in parts of the Pacific Northwest. Well, first of all, the marionberry simply tastes better. Also, though it is technically a blackberry, it won’t try to take over your backyard shed in the next couple of months. Read on for more on what distinguishes the marionberry from its noxious cousins. The marionberry was developed by U.S. Department of Agricultural researcher George F. Waldo at Oregon State University in Corvallis in the nineteen forties. It is a cross of the flavorful Olallie berry and the high-producing Chehalem berry, both of which are also caneberry hybrids. The Olallie berry is a cross between the youngberry and the loganberry, each of which is also a caneberry hybrid. The youngberry is a cross between the native pacific blackberry and dewberry, while the loganberry is a cross between the native blackberry and the raspberry. On the other side of the marionberry family tree, the Chehalem berry is a cross between the noxious European Himalayan blackberry and the Santiam blackberry. The Santiam is a cross between a native pacific blackberry and the loganberry. Got all that? And yes, loganberry is marionberry’s grandpa on one side of the family and great-grandpa on the other. Waldo was also responsible for some of the other cross breeding of species that led to the marionberry’s eventual cultivation, but we’ll save all that for another article someday. Suffice it to say that Waldo crossed the Olallie and Chehalem at OSU in 1945, and began testing the new species in Marion County, Oregon in 1948. The tests were successful enough that the berry was released for general cultivation in the mid-fifties under the name “Marion,” and has since gone on to become the single most cultivated blackberry in the state, with something like thirty million pounds being produced annually. The Willamette Valley accounts for more than ninety percent of all marionberry production in the state, as the berry was specifically cultivated to thrive in the comparatively mild, wet summers of western Oregon. The berries ripen in early summer, and a single acre of marionberry canes can produce up to six tons of fruit in a good year. When most folks think of blackberries, they think bush. The marionberry, however, is actually a trailing vine, with most plantings producing just a few canes, or vines. These canes can grow as long as twenty feet though, producing fruiting branches along most of their entire length. And though technically a member of the rose family, the thorns on a marionberry cane are much sharper and more densely packed than those of a rose bush. 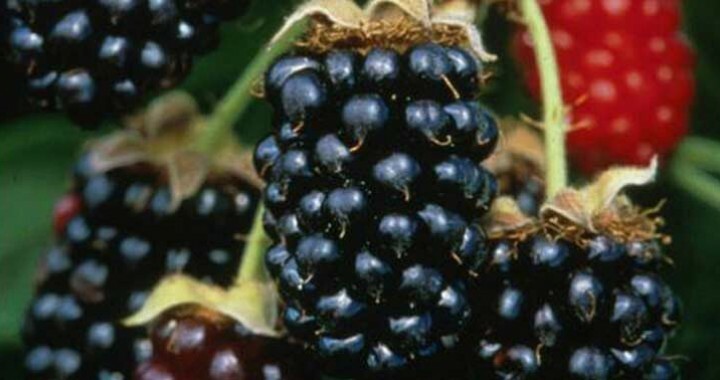 The berries produced by a marionberry cane are known for their glossy shine and dark, almost black color when on the plant. When the berries are picked and processed, however, they turn a dark purple fleshy color. 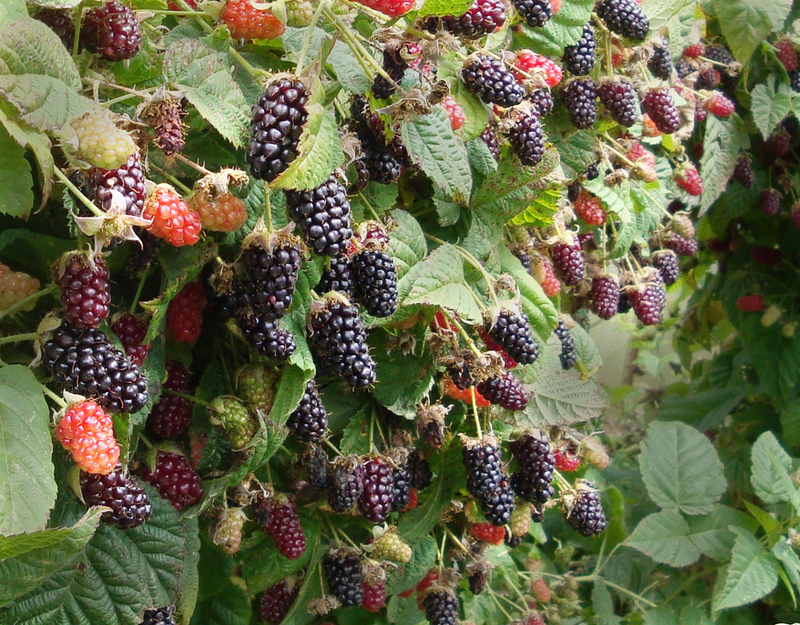 Compared to other blackberry cultivars, the marionberry produces medium-sized fruits, conical in shape, and about an inch in length. The fruits have a comparatively tart but complex flavor that combines earthiness with a hint of sweetness. They are larger in general size, juicier, and sweeter than the fruit produced by the Evergreen blackberry or Himalayan blackberry. Do not confuse the marionberry with the kotataberry, though. Like the marionberry, the kotataberry was originally bred at OSU. But the kotataberry was designed to withstand the cold and produce a firm fruit despite the wetter growing conditions of its primary season. They ripen and come to market earlier in the year, but are nowhere near as tasty or popular. And do not confuse the marionberry with the evergreen blackberry, either. The evergreen blackberry has been successfully cultivated, in thorn-less varieties, and though it is generally considered to be a noxious or invasive weed these days, you may still find it fresh or frozen in the market. And finally, do not confuse the marionberry with politician Marion Barry. See disclaimer above. The marionberry is known for making excellent jams and jellies, and makes for a great flavoring agent for everything from pancake syrup to vinegar to hot sauce. Several marionberry-scented candles and air fresheners are currently marketed for home use. And even the fleshy purple color of processed marionberries has been used to market everything from tote bags to fingernail polish colors. In Oregon, marionberries have been incorporated into just about every type of recipe imaginable. Most notable for their popularity are, of course, the marionberry pie, cobbler, ice cream, and milkshakes. Other potential uses for the berry range from craft cocktail recipes to drinking shrubs, and from cheesecakes to scones. And heated marionberry jam makes an excellent sweet glaze for roasted meats of various kinds. Given the flavor profile and relative complexity of the marionberry’s flavor, its potential culinary uses are nearly limitless. While in season, Bipartisan Cafe in Portland bakes fresh marionberry pies, as well as fresh triple berry pies, both of which are delicious. 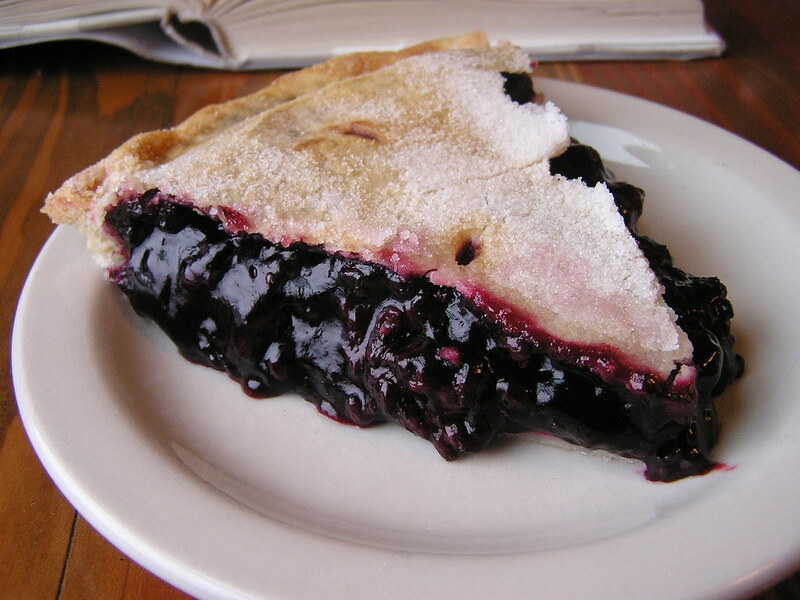 Contact the pie baker at Bipartisan Cafe and order your freshly baked marionberry pies today!